Scientists have spotted a potential asteroid crater in Greenland just 114 miles away from another one announced a few months ago. But the newest crater is even larger—it would be the 22nd largest on Earth. After the announcement of the first crater discovery last year, scientists went sifting through data in hopes of finding more craters hiding beneath Greenland’s ice. They found another potential crater over 22 miles (35 kilometers) in diameter. It brought up quite a few questions. 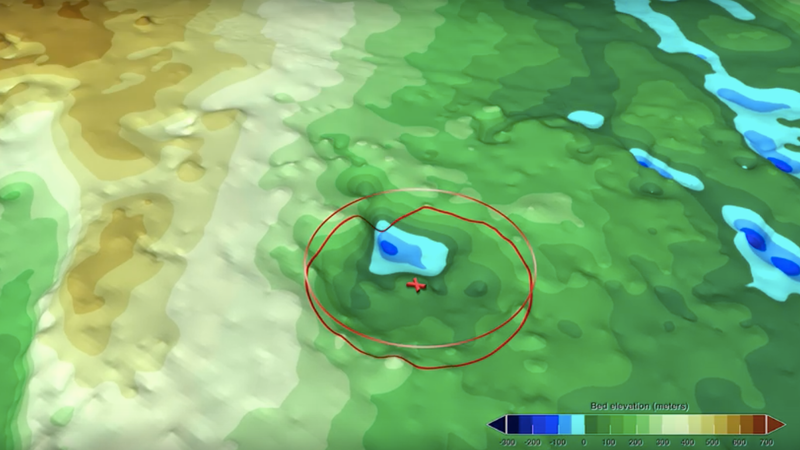 Airborne radar surveys of Greenland first revealed the 19-mile-wide Hiawatha impact crater, thought to have originated from an asteroid strike some time between 12,000 and 3 million years ago. The data revealed another circular depression near Hiawatha. When MacGregor looked a little closer, it showed all of the signs of yet another crater, a little wider and about half as deep as the first. MacGregor, addressing whether the feature could have been caused by something other than an asteroid strike, said that there wasn’t evidence to support similar-looking structures, like a collapsed volcanic caldera. If the new crater is indeed an impact crater, it’s hard to say how old it is—it lies beneath ice at least 79,000 years old, so that’s probably the minimum age. And, given the erosion caused by the waxing and waning of the glacier itself, it’s probably not older than 2.6 million years. As for the name, the scientists suggest naming the crater the Paterson crater after Stan Paterson, a glaciologist who made one of the earliest-known ground-based journeys to this region in Greenland. The Paterson crater had the researchers wondering: Is it at all related to the nearby Hiawatha crater? There’s evidence both in favor of and against the two craters forming nearly simultaneously, according to the paper, published in the journal Geophysical Research Letters. But “their proximity is plausibly but not conclusively explained by chance,” bolstered in part by their different shapes and the older ice on top of Paterson. There’s plenty of mystery surrounding this depression, including whether it’s a crater at all. Unlike Hiawatha, the Paterson crater is beneath 2 kilometers of ice, making it far more difficult to study and to gather the recrystallized rock that would result from a large impact. But it demonstrates once again that there are geologic mysteries sitting beneath glaciers, and makes you wonder whether there are more massive impact craters waiting to be found.